Supernumerary, or extra, teeth may or may not result in secondary problems. The most common problems that may occur because of supernumerary teeth include orthodontic malocclusion or crowding of teeth. Supernumerary teeth should be radiographed (x-rayed) to make sure they are healthy and not causing secondary problems. 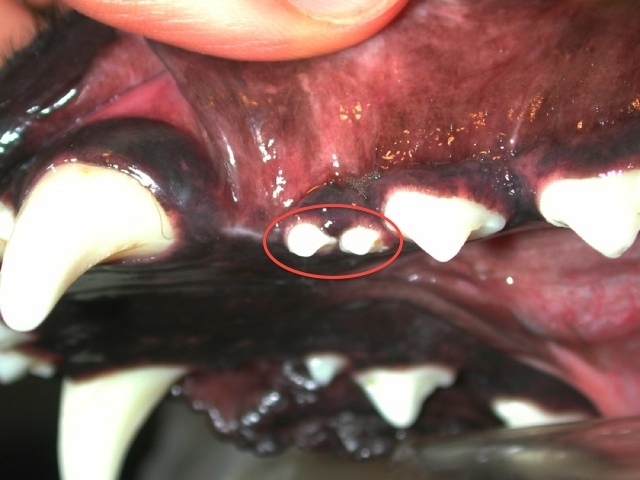 To the left, two premolar teeth are seen circled where there should only be one. If malocclusion is present, extraction is recommended since the misaligned tooth can cause damage to the normal, healthy teeth that are normally present. If the teeth are crowded from the extra tooth, increased bacterial, plaque and food retention may occur, thus predisposing the site to periodontal disease. If crowding is present, extraction of the extra tooth would be recommended. Finally, if the extra tooth is a small, under-sized "peg tooth", they are usually extracted.